Crafting an experience which is just as potent on the ears and emotions as it is visually on the imagination, the Long Time Lost EP from Finnish rock band Svartna is one of those propositions you just immerse within without reservation. It is a mesmeric fascination of sound and feeling which envelops and consumes attention and thoughts, a rich emotive flight unafraid to court its shadows as deeply as its beauty whilst providing an absorbing canvas for the bewitching voice of project founder Janica Lönn, who has previously worked with Black Sun Aeon. Svartna emerged to the end of 2012 within the thoughts of Lönn, its intent as an audio-visual creation already and to some extent secretively laying seeds within the artist across almost a decade of musical invention and realisation up to that point. Concentrating solely on the new adventure and fusing her love of photography and crafting new ventures into its music, Lönn has conjured a debut which invests the invigorating essences of rock and metal with a pop infectiousness, the result a trio of songs which merges numerous styles and flavours into startling and gripping melodic landscapes coloured by rich sonic textures and heavy emotional breath. Evocative melancholic keys open up first song No Signs of Life. Already the heart of the track and its narrative are caressing ears before the elegant smouldering tones of Lönn and an orchestral ambience glide into the emerging picture. It is a symphonic seeded suasion which to its seductive coaxing brings a shadowed clad drama and to its expanding scenery slightly sinister whispers. Bass and guitars offer a subdued but clear snarl to the emotive beauty washing the senses too whilst the increasingly sirenesque vocals and poetic melodies ignite the imagination, the full incitement of the song coming with a broad and climatic wind which drives the compelling expulsions at the heart of the song. The track is a masterful musical canvas for the lyrical and vocal melodrama, a picture which evolves with every chord and flume of sonic endeavour. It is quite glorious and never falls into the over blown realms so many bands and artists find when emotions and passions align with orchestrated invention and epic tempestuous structures; at times it is almost earthy and certainly surprisingly intimate in the throes of its fullest impacting voice. From the outstanding start Cornered by Death takes up the reins of the release’s persuasion next, again keys sculpting the initial premise as rhythms play within their graceful countenance. The song glides into view in comparison to its predecessor, keys and vocals the warm initial sun upon ears and thoughts before a stormier yet still relatively unthreatening swell of heavy intensity, rapacious riffs, and prowling rhythms cloud the simmering emotional flight below. Once more it is offers a powerfully evocative aural sight though it is with the subsequent enthralling crafting of the guitars that the song truly comes alive; their lyrical designs virulently tempting even in their brief shaft of light before the full body of the song comes over senses and emotions once again. Though not matching the opening triumph, the track is a transfixing and exhilarating creative soundscape. The EP closes with Worlds Apart, its entrance emulating the previous pair in being shaped by keys and vocals alone. To be honest there is a little disappointment that it does not bring a completely different first touch to the ears compared to elsewhere but a thought soon forgotten as the breath-taking voice of Lönn and a sinew built range of rhythms roam the expressive radiance flaming over the senses through the provocative keys, blazing guitars, and always the persistently striking voice of Lönn. It is an ambrosial conclusion to a fascinating and sublime release from an artist and band which are surely destined to seduce ears and acclaim for a long time on this evidence. Long Time Lost EP is available through Violent Journey Records now! 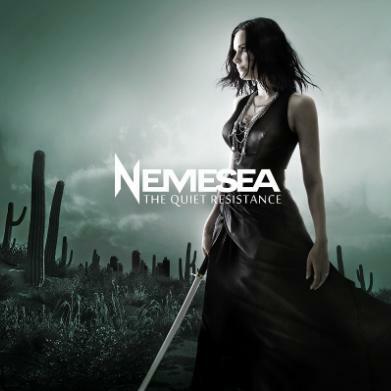 2011 saw Dutch rock band Nemesea sign with Napalm Records leading to the release of their third album The Quiet Resistance, an album bringing vibrant well written songs and striking electro/metal/symphonic rock sounds. We had the chance to ask vocalist Manda Ophuis about the album and about the band generally. Hi and a big thanks for chatting to us at The RingMaster Review. Could you please introduce the members of Nemesea and how you all met and became part of the band? 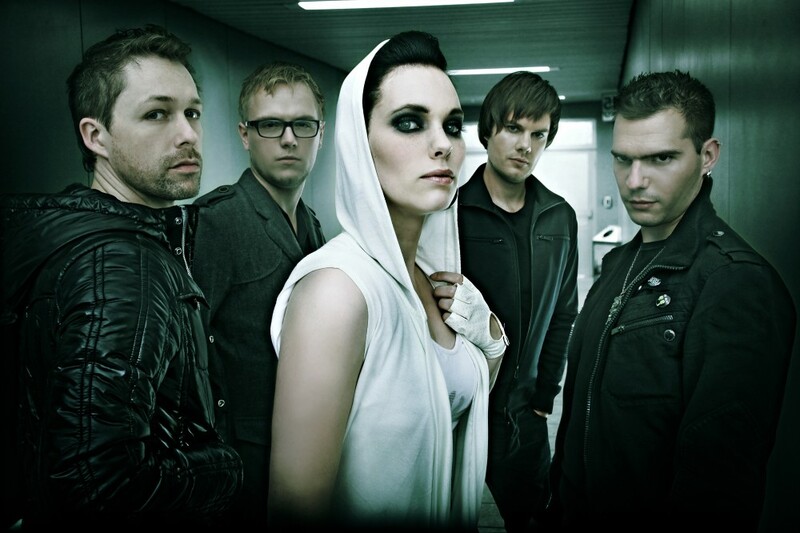 Nemesea started in 2003 after HJ (guitars) and myself (vocals) met each other at the conservatory where we both studied. HJ knew Sonny (bass) from the conservatory also and they already played in several bands together, so Sonny joined in 2003 also. Lasse (keys and electronics) has taken part of the Nemesea household in 2009 and Frank (drums) joined recently, just before the recordings of TQR. What were the inspirations that led you into music? I started playing music since I was really young. I’ve always known I wanted to be on stage since I was 9 years old. After hearing Anneke van Giersbergen sing I knew it had to be as the singer of a band. In general we are inspired by bands, musicians, music styles, sounds and the feeling people get from music, this is something extraordinary. Your debut album Mana first alerted a wider audience to your music, how do you look back at it in comparison to the music you have just released within The Quiet Resistance? I don’t feel that Mana has alerted a wider audience than our later albums. Mana was a gothic Metal album that drew a very specific kind of audience. I feel that with In Control and now with The Quiet Resistance we are able to reach a wider audience. What is the strongest difference between the band then and now? First of all the band line up and the fact we live in 2011. We developed a musical style we are all truly happy about. We keep progressing and see this as a positive thing. With sites like Kickstarter and Pledge music set up to try and give bands and artists an avenue to finance the next step in their journeys tell us about Sellaband and your experience with them leading to second album In Control? Sellaband was a great experience for us. Fans believing and investing in you, a band. Because of the large budget invested by fans & believers we were able to work with a lot of talented and well-known people like Tony Platt (AC/DC, Iron Maiden) and Ronald Prent (Rammstein, Lacuna Coil). We’ve learned a lot from them and learned to work, write and produce on a higher level. But after we finished the album there was no follow up, no promotion and no gigs so we had a great album but nobody knew about it. That was really disappointing for us; we had high hopes for that release. Unfortunately the Sellaband concept wasn’t working as it should. You were definitely one of the site’s biggest successes but do you think these kinds of sites are a viable solution for most bands in finding reasonable funds? If you only want to record an album for family, friends and small fan base it’s okay to do it like that. If you aim for a bigger audience you really need an experienced group of people surrounding your band to reach higher goals. As mentioned you have just released your third album The Quiet Resistance, what were your aims going into recording it and did it match or exceed those by the end of the process? Because of the fact that the recording budget was small we had to be very creative with all steps taken during the process. Basically all was recorded and produced at home. We did all the editing ourselves etc etc. In such a situation it’s difficult to aim for something because everybody knows what to aim for but at the same time know it’s not doable. We took it step by step and during the process we started to create something we could work with. At the end it all came together in way but wasn’t something we had in mind on beforehand. The result was very positive so we were pleasantly surprised and that’s a good thing. Many have said the album takes the best bits from your previous releases to take them further with a more aggressive and vibrant energy, would you say that is a fair comment? Yes, we feel that too! The heaviness of Mana and the electro influences of In Control combined in structured songs. The Quiet Resistance seems to have two distinct sides, with the instinctively powerful melodic songs and emotive ballads as in ‘Afterlife’ and ‘I Live’, and the dark disturbing and stirring more industrial sounds of ‘2012’ and the brilliant ‘Allein’. Was this deliberate in your songwriting to have a dual but separate approach or it simply evolved naturally? It evolved naturally but at the same time felt necessary to us. We hoped to write an album that showed different sides, elements, sounds, songs and influences. Will we see more and more of the harsher and striking atmospheric metal sounds in the future? We can’t say anything about that because our taste and inspiration changes rapidly. We first hope to play the TQR material live on stage as often as possible. We will start writing next year and we’ll see what comes out. It will definitely be different from what we did until now. That is very important for us. The album has featured guests such in Markus Klavan and Matt Litwin of Bulletproof Messenger and Heli Reissenweber of Rammstein cover band Stahlzeit, how did these links up come about? We know Marcus and Matt from Sellaband. They were on Sellaband with their band Bulletproof Messenger. We had some contact through email before and we thought it would be cool if they could contribute their talent to our album. Heli we heard about but didn’t know personally. We got in touch with him through the internet. Were the songs they contributed to ready before their addition or evolved with them? The songs were ready and already written for the bigger part when these guests performed on them. It’s Over was partly co-written by Bulletproof Messenger. (Question for rest of the band) Obviously Nemesea is a band but one of the notable things that makes you distinct from similar flavoured groups is the wonderful vocals of Manda, given her skill and range do you write songs with that in mind from the start? We surely do. We are strong believers of vocal being key, the most important thing in (our) songs. We are very happy that Manda has her own sound and is working on her vocals the way she does. She is still developing and we believe she hasn’t reached her limits yet. Please give some insight into the writing process for your music and lyrics. Music: Is written by HJ (guitars). He’s a real song writer and lover. HJ is always trying to write the best melodies possible. He writes song in their basic format, on acoustic guitar or piano. Some songs start with a riff and then he writes the songs round that. Lyrics: It differs for every lyrics. Sometimes it’s just a word of a sentence, sometimes it’s a certain feeling or something that happened to me or people I care about. The Quiet Resistance is your first release through Napalm Records; this must have made recording the album a totally different proposition to the previous albums? What is next for Nemesea? We don’t know…. We hope people like the album and we hope we can get on the road playing shows. We hope to tour as often as possible but it’s not really within our control. Many thanks for taking time to talk with us and good luck with The Quiet Resistance. Would you like to end a last thought or with some words for your fans? Give TQR a go and let us know what you think. We worked hard on getting this album out there. We are very proud of it. Hope to see at one of our gigs. The Quiet Resistance from Dutch rock band Nemesea is a bit of a conundrum, on one hand it is a vibrant well written and realised collection of electro pop/symphonic rock tunes but on the other leaves the distinct thought that the band could have found and given even more to place the album as a must have contender. There is almost a sense of being short changed on the release and though that is being maybe over critical the feeling is there, The Quiet Resistance being a good strong release but a certain lost opportunity to create something really special. Formed in 2002 by vocalist Manda Ophuis and guitarist Hendrik Jan de Jong later joined by bassist Sonny Onderwater and Frank van der Star on drums, the quartet from Groningen found eager attention with their 2004 debut album Mana and from successful extensive tours. Second album In Control appeared in 2007 after the band signed up at sellaband.com to become one of the sites notable successes. This year saw the band sign with Napalm Records and the imminent release of The Quiet Resistance. Drawing on the best elements of their previous releases The Quiet Resistance exudes a stronger and more aggressive sound whilst still retaining the immense melodic pop and rock sound. Nemesea is certainly not going to numb senses and break down walls with their intensity but there is a certain shift to firmer and more imposing riffs and energy alongside the harmonics and graceful sounds. There is also a deliberate move into more electro pop flavours which though varied in depth from song to song make the release even more accessible to a wider array of ears. Ophuis is as ever impressive with her voice and delivery and the focal point on most tracks with the music playing for her at times rather than with her. This is not exactly a criticism as it works well and the band creating their sound from an Evanescence/ Within Temptation type mix… not exactly though it does feel like it restricts the bands hinted real identity to fully shine. Before continuing it should be noted that despite what is written here the album was fully enjoyed and will happily be listened too again and again, thus the puzzle and feelings of a missed chance to create something truly unique as glimpsed constantly within the album’s walls by some fine moments. It is no coincidence that the truly inspired and strongest tracks are the ones where the band step away from the pop/rock Evanescence flavoured songs which the band have mastered wonderfully with songs like the glorious ‘Afterlife’, the simple and effective grace of ballad ‘I Live’, and ‘Say’ with its deep dark bass twang and striking guitars recalling a Linkin Park/Evanescence link up. Good enjoyable songs that play with ease just without enflaming or inspiring the senses. It is the tracks where the band take big steps into newer climes that they show there is much more within them waiting to be unleashed. The two industrial powered songs in opener/intro ‘The Quiet’ and the dark apocalyptic soundscape of ‘2012’ are stunning, emotive and expressive in sound and intent. Though both are without proper vocals, basically instrumentals they show the band do have distinct power and ideas, and know how to deliver them. Alongside these we have the excellence of ‘It’s Over’ and ‘Allein’. The first going down the Sick Puppies rock road features Markus Klavan and Matt Litwin of American band Bulletproof Messenger and drives for the ear with eager metal intent. Within the opening chords and first line the song has the ear alert and pulse excited, the vocal blend of male and female vocals a perfect mix as is the synth waves of sound alongside the driven guitars. ‘Allein’ is easily the albums best track and one hopes a direction they will look at more in tandem with their melodic rock sounds. Another industrial inspired slice the song features vocals from Heli Reissenweber of Rammstein cover band Stahlzeit, and it is no surprise there is a distinct Rammstein flavour. The track excels with the again great vocals from Ophuis alongside Reissenweber, its power and diversity the cause of eager anticipation of more in this vein from the band. The Quiet Resistance is a great album, well created and delivered and at every point makes listening to it a pleasure. It just could have been a classic if the band had been more adventurous throughout and experimented more, but as the enjoyment is still strong all should go take a listen and decide for themselves.